Since I’m using ADF as the main technology for my current project and I wanted it to integrate with jBPM 4 I had no choice. WLS (Weblogic BEA) is currently the only platform which supports ADF 11g. So I had to get jBPM running on WLS. In this battle I had several barriers to take, some of those are more related to the ADF technology rather than to the WLS server. These are the ones you really need to get the jBPM engine running. I suppose this step is more related to the use of ADF en JDeveloper but I share it with you anyway. 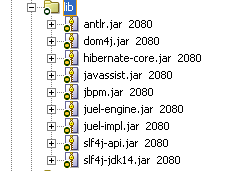 Since there are already certain jBPM libraries present in JDeveloper and ADF those one are used by default rather than the one you specify in the WEB-INF lib folder. To tell your application server to prefer the ones you added in the WEB-INF\lib folder you have to add a deployment descriptor. This option tells WLS to prefer the jar files specified in the WEB-INF\lib folder instead of the ones who are installed inside the application server. Jobs done, now it should be possible to run jBPM inside your web application on Weblogic.